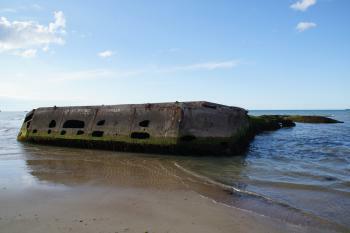 Les Plages du Débarquement, Normandie, 1944 is part of the Tentative list of France in order to qualify for inclusion in the World Heritage List. I visited all 5 landing beaches of Normandy and the Pointe du Hoc this week. The site is expected to become a World Heritage Site in 2019 for the 75th anniversary. The museum at Utah Beach was very good, giving a great overview of the timeline for that beach and the Americans as a whole. The Juno Beach Center was a great way to learn about the Canadian involvement in D-Day plus it was a great overview of Canadian history as a whole. Highlights: Canada House, La Cambe German War Cemetary, Normandy American Cemetary, and Gold Beach. I would highly recommend going during June for the anniversaries if you're interested in meeting veterans and hearing their stories. We met American, Canadian, and German veterans. I have more photos here: Normandy: Commemorating D-Day in Pictures (Photo Essay). The events related to Normandy 44, the operation Overlord and the WW2 in general, are of primary universal significance. These events shaped today’s world. The proposed sites in Normandy provide a clear testimony in the sense that they are well preserved and that the events and facts associated are clearly stated and explained. In my opinion, this site deserves to be part of the WH list for its universal significance and as a testimony of one of the worst period in history. However, the idea of a transnational site, gathering several symbols of WW2, should be privileged. First, it would carry the idea of gathering people and nations. Second, it would provide a better, wider and clearer testimony of this period and the events that occurred over a decade. Finally, it would show the global nature of the conflict. In order to retain the most complete testimony, such a site should include, among the symbols and in addition to Normandy, memory sites of Bastogne, Pearl Harbour, Okinawa or Kanchanaburi as well as other sites in North Africa, Asia and Europe. The "Plagues du Débarquement" or D-Day beaches were added to the French T-list at the same day as the funeral sites and memorials of WWI. Two seemingly similar nomination, but there is a substantial difference between these two tentative sites. The WWI proposal focuses on memorials and burial places, whereas the D-Day sites include the battlefields itself. The description on the WHC website lists the following parts: the five landing zones (Omaha, Utah, Gold, Juno, and Sword), the remains of two German batteries (Pointe du Hoc, Longues-sur-Mer), the remains of the artificial harbour Winston Churchill (at Arromanches-les-Bains) and underwater vestiges. Cemeteries and memorials are also mentioned and the term 'cultural landscape' is used, but no specific site is mentioned. When we were preparing our trip in August 2015, the question arose which sites are worth a visit. Well, European beaches look more or less similar, just simply a coastline with sand. And so are the beaches in Normandy. So, walking along a beach, just because hundreds of thousands soldiers have landed there seventy years ago? Does not sound very exciting to me. However, the beaches in Normandy are very popular in summer with bathers and 'World War tourists', and the numerous museums and visitor centres along the coast are all well attended. We are not very interested in militaria and military history, so we skipped visits to the museums and decided to focus on the proposed sites at Arromanches (Gold Beach) and around Omaha Beach which seemed to be the most interesting parts. Arromanches is a pleasant town with souvenir shops and restaurants on the waterfront. Here, the Mulberry B harbour , also named Port Winston, was built. It was used by the British and Canadian invasion forces. And indeed, the remains are still visible from the beach: a line of concrete structures and breakwaters along the horizon. Some remains are close to the beach, embedded in the sand and even accessible at low tide (photo). It is somewhat surprising that these ugly concrete chunks have been preserved, probably it was too costly and expensive to remove them. Just five kilometres west of Arromanches is the German defence battery Longues-sur-Mer, in the middle between Omaha Beach and Gold Beach. 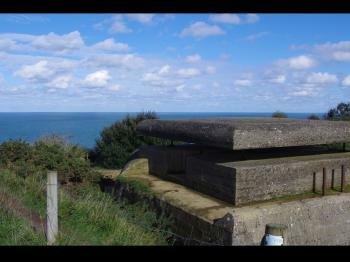 It consists of five gun bunkers (the guns have been preserved) and the command post at the coastline. Not very interesting in my opinion. The loop road is a leisurely walk of half an hour, the battery is freely accessible. A few kilometres further to the west is Omaha Beach and the American Cemetery and Memorial in Colleville-sur-Mer. It is the most famous American WWII cemetery on European soil and the endless lines of white crosses and stars of David are impressive, more than 9000 soldiers are buried here. Style and design of Colleville are comparable to cemeteries and memorials of the WWI nomination that we visited later on this trip. It is likely that the Colleville cemetery is within the proposed core zone, it is located on a bluff close to the beach overlooking the landing zone. Finally we visited Pointe du Hoc, a headland west of Omaha Beach. Its strategic importance is obvious, long stretches of the coast can be controlled from the cliff. The remains of bunkers and gun emplacements can be visited on a one kilometre trail. The next day, on our trip to the Vauban tower at Saint-Vaast-sur-Hogue, we passed Utah Beach, the westernmost D-Day beach. We made short stops at the Utah Beach Memorial and the Leclerc Monument. Here, as in many other places along the beaches, you can still see remains of German gun emplacements and bunkers. All selected sites are located directly at the shoreline, similar fortifications in the hinterland are not mentioned. The areas given in the description suggest that the core zones encompass only narrow strips along the coast. Thus, significant cemeteries and memorials are probably not part of the proposal, only the Colleville cemetery is close to the beach. Examples are the Caen memorial and the cemeteries in Bayeux (British), La Cambe (German) and Beny-sur-Mer (Canadian). Obviously the focus is on the war zone and the military conflict. This leads to the question, whether the D-Day beaches should be a World Heritage Site? Or in other words: are battlefields appropriate World Heritage Sites? In general, I have only little admiration for 'military genius' and this may explain my rather critical attitude on that issue. Of course, history can be seen as a continuous succession of wars and battlefields often symbolize important turning points. A large part of the WHS is connected with wars, conquest and destruction, but this is rarely the predominant aspect. And the justification on the WHC website is not convincing. The German Atlantic Wall is compared with other historical lines of defence (Great Wall, Limes, Vauban) and the remains of the artificial harbour are regarded as a symbol of the logistical effort to conquer this wall. Undoubtedly, the Great Wall and the Roman Limes were of greater historical significance, not only because they sustained over a longer period, they were much more than just a defence line. And the fortifications of Vauban are inscribed as works of architecture and civil engineering, not as locations of military conflicts. Further comparisons are made with the Independence Hall (a bit farfetched) and Marathon. And even the unique role in WWII is questionable. Stalingrad is mentioned, the text reads: “Toutefois, les deux événements n’ont pas la même portée s’agissant de signification universelle exceptionnelle” (however, the two events do not have the same scope in terms of outstanding universal significance). Russia would certainly disagree. 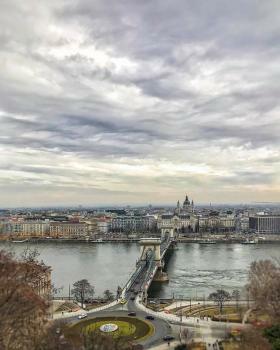 A second aspect of the justification aims at the Liberation of Western Europe, the sites as symbol of peace and freedom. Even more problematic: battlefields as symbols of human values? No doubt, the D-Day beaches have a symbolic content, they would be inscribed for what has happened there, not for any visible attributes of the remains. In this context other memorial sites are mentioned: Robben Island, Gorée, Auschwitz and Genbaku. Well, it's more my personal feeling than a rational justification, that the D-Day beaches do not fit in this line. So should the D-Day beaches be a WHS? I would say: No.